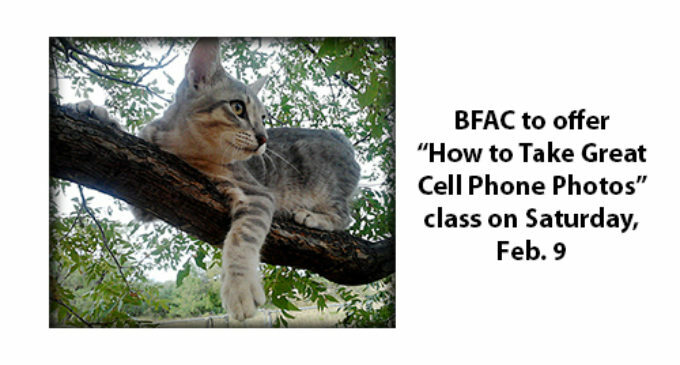 The Breckenridge Fine Arts Center will mix technology with photography and creativity when it hosts a class, “How to Take Great Cell Phone Photos,” by professional photographer and journalist Tony Pilkington from 10 a.m. to 3 p.m. Saturday, Feb. 9. In the class, students will learn how to unleash the power of their phone’s built-in camera. In the class, Pilkington will draw on his photography experience to share shooting techniques, such as the best ways to compose a photo for the most impact, when to make it a vertical and when to shoot it as a horizontal. He will also provide tips for shooting in different lighting situations, when it’s best to shoot with flash and when to use just natural light. Plus, the class will cover how to shoot great selfies, or self portraits, as the pros call them. Additionally, the class will cover the different ways to save, share and export your files to make them look their best on your social media platforms or for making great prints to frame or share. This class is designed to teach students how to push their phone camera to its limits of creativity and then how to work around some of those limits to get great photos. Tony Pilkington is a professional photographer who has shot a wide variety of subjects over the years for magazines, wire services, newspapers and business clients. He has developed classes and has taught them in various locations in Lubbock and at the Breckenridge Fine Arts Center. He is currently publisher and managing editor of the online news site the Breckenridge Texan and shoots a wide range of photo subjects on a daily basis. The class, which is open to anyone age 15 and older, will cost $35 per person, with a portion of the fee going to support the Breckenridge Fine Arts Center. The deadline to register for the class is Thursday, Feb. 7. To sign up for the class or for more information, call Shalon Wilson at the BFAC, 254-559-6602, send an email to info@breckenridgefineart.org or visit the BFAC at 207 N. Breckenridge Ave.